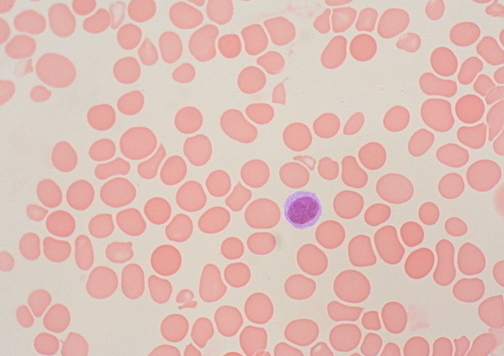 The macro-ovalocytes in a case of pernicious anemia are larger than the normal small lymphocyte. Note that these large RBCs lack a zone of central pallor. There is no polychromasia, and if a reticulocyte count were done, it would be low. Note anisocytosis and poikilocytosis. The serum homocysteine and methylmalonic acid levels are increased, often before macrocytosis and a decrease in cobalamin (B12) occurs. As the disease progresses cobalamin (vitamin B12) levels will be consistently decreased as well. Only homocysteine will be increased with folate deficiency.